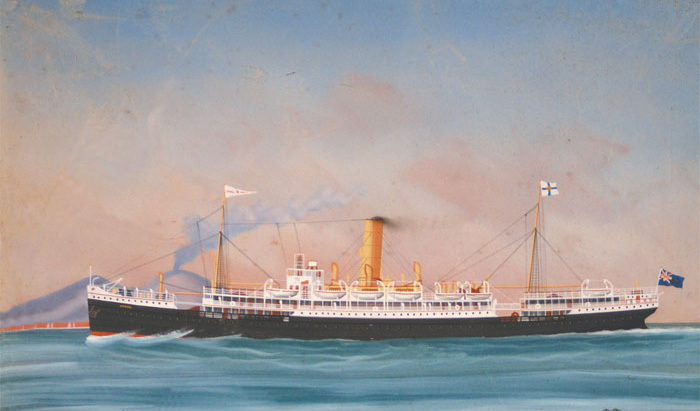 The OMRAH was built by the Fairfield Shipbuilding and Engineering Co, Glasgow in 1899 for the Orient Line. This was a 8,130 gross ton ship, length 490.6ft x beam 56.6ft, one funnel, two masts, twin screw and a speed of 18 knots. She could carry 350 in the first and second class and 500-3rd class passengers. and on 3rd Nov.1916 she commenced her last London - Australia sailing. Converted to a troopship, she was torpedoed and sunk off the coast of Sardinia on 12th May 1918.
and was on her return journey from Marseilles when lost without serious loss of life.